Add humidity to any room. No electricity needed! Naturally add humidity to any room of your home without increasing energy costs. This eco-friendly alternative offers an effective way to raise overall moisture, and it's able to do so without a single bit of electricity or battery power. This means that you don't have to worry about placing it next to an outlet, and your energy bill won't increase due to its use. The G-Midifier will offer the same benefits of more expensive, electronic versions, but it'll help you eliminate many of the common annoyances at the same time. There won't be any loud fans to create a constant hum, and there won't be any expensive filters to replace on a regular basis. You also won't have to worry about over humidifying the room to cause water stains on ceilings, walls or furniture. Despite the lack of buttons and moving parts, this naturally simple room humidifier will be just as effective as traditional units when it comes to combating the dry air in your home. Use one in any room to make it more livable by counteracting the lack of moisture caused by seasonal climate change or the operation of furnaces and air conditioners. Affordable. This one room humidifier is inexpensive to buy, and super cheap to operate. There are no break downs to worry about, or expensive filters to replace all the time. No Mess. You never have to worry about too much mist being sprayed on walls or wood furniture, and there will never be a puddle of moisture surrounding the unit. Avoid wiping down surrounding areas, or dealing with damage and grime resulting from waterlogged materials. Quiet. No moving parts means totally silent operation. Never get annoyed again with this quiet humidifier. Ideal for bedrooms and other locations where noisy models that use fans, motors and other electronics are a problem. Sanitary. The occurrence of mold, bacteria and other germs is greatly reduced in comparison to traditional units. With no hidden compartments, mold-resistant materials, and no ability to spray water outside of the container, this unit offers a healthy and clean way to humidify your home. Electricity-Free. With no cords, outlets or batteries to worry about, or skyrocketing energy bills to pay later, the G-Midifier offers an economical way to humidify small spaces, and there will be almost no impact to the environment or your wallet. As an added bonus, the lack of cord also results in convenience because you can place it anywhere without worry of how close it is to an outlet. Simple. Just fill it and forget it. This green humidifier will automatically maintain a comfortable environment by adding the perfect level of moisture to the air. Place it in any room to naturally maintain a humidity level between 25-55% without any control panels, dials, or computer controls. Portable. Thanks to the compact and lightweight design, you can easily move it to any room, so you can easily keep it right where you need it. Dishwasher Safe. It won't get dirty as fast as traditional units do, but when it does you'll be able to let your dishwasher clean it for you. Just pop it in, pads and all because everything can be washed automatically when necessary. With the G-Midifier, water isn't blown around or ultrasonically evaporated in order for it to diffuse into the air. It works by simple evaporation techniques, but the advanced design makes it incredibly efficient. The entire unit is essentially a container that holds water and several pieces of absorbent material in an upright position. 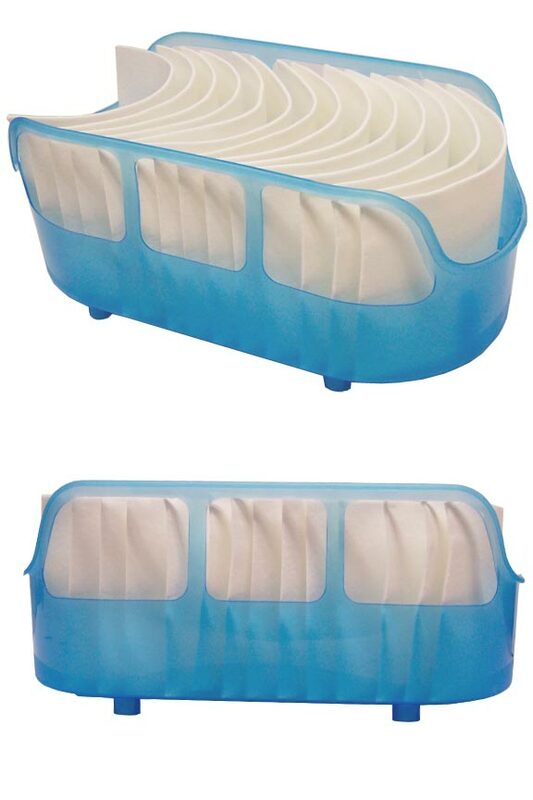 The container is designed in such a way to allow for maximum air flow in all directions, so the air in your home is able to flow up through the bottom of the container, and all around each piece of material. This key design feature is integral to functionality, and the secret to why it works so well. Each piece of filter material is actually comprised of a highly absorbent polyester material that's able to soak up several times it's own weight in moisture. These absorbent squares will wick water from below in order to completely saturate themselves. This action vastly increases the surface area of the water in order to increase evaporation. Once the water evaporates off the pad, it's diffused into the air and the humidity in the room goes up. A single unit is good for a normal sized room, and can easily humidify areas of up to 200 square feet. Fill it and forget it. Using this humidifier could not be easier. Once you find the perfect location, just add water to make it work. To add water to this humidifier, you simply pour it into the bottom of the container. The large opening at the front, and the curve of the pads makes this action easy. Once filled, the water will disburse itself evenly, and then the white squares of material will do the rest. Ideal placement of the unit would be over a heater or AC vent on the floor, but it can literally be used anywhere with great results. When placed over a vent, the increased air flow will improve the effect, and allow more water to evaporate in a shorter amount of time, but when placed anywhere else, it will still work with optimal results. 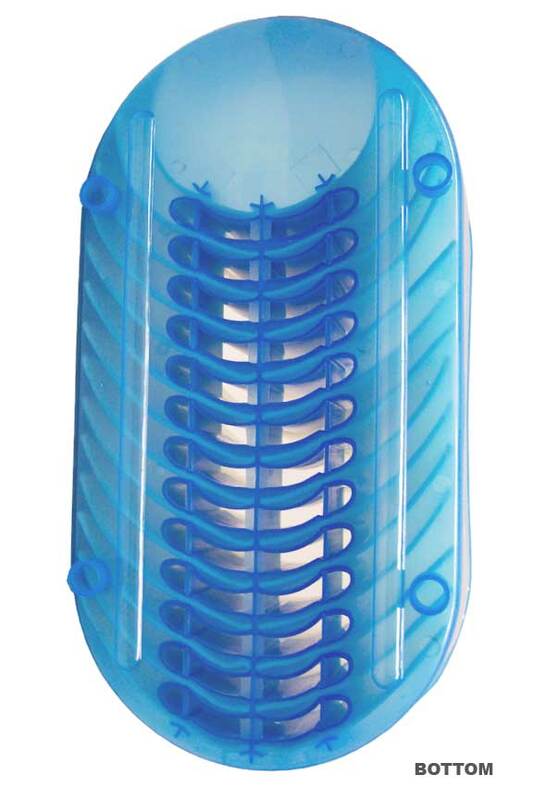 The unit is the perfect size to cover the full vent, and when the air blows, it will flow up through the integrated holes and then over and through each filter. The feet on the underside allow for good air circulation when placed anywhere, so the G-Midifier will also be effective even when placed on a shelf or dresser. To use it, simply find a level place to put it, and then fill with water. It doesn't need to be over an air vent, but utilizing one will increase air flow, and allow it to provide more humidity. Once placed, simply fill with about a half gallon of water. The filters will begin to soak up moisture right away in order to evaporate it into the air, but it may take several hours for them to become fully saturated. Once they are completely soaked, the unit will operate at full capacity until the water runs out. Please Note: Any type of water can be used, but distilled or filtered water is substituted, it'll prevent minerals and other contaminates from discoloring, or otherwise dirtying the pads. This will decrease the frequency of maintenance that's required, and increase the longevity of the pads. Overall, this humidifier is very easy to maintain. The pads won't need to be replaced for several years, and the unit won't get as dirty as one with motors, fans, and other moving parts. When it does get dirty, simply pop it in the dishwasher and it'll come out clean and ready to go again. Thanks to the container material, and the unique filter pad material, this unit will not grow mold, bacteria or mildew even though it's also designed to be wet all the time. The pads can be removed for replacement or washing, and it's as easy as slipping them in or out of their respective slot. Once you set this down the main thing you'll need to worry about is keeping it full of water. Other than that, it will provide silent and maintenance-free use while eliminating harsh dry air in your home. Order Yours Today! Dimensions 13" x 6.75" x 5.5"
Uses Add moisture to the air without using electricity. 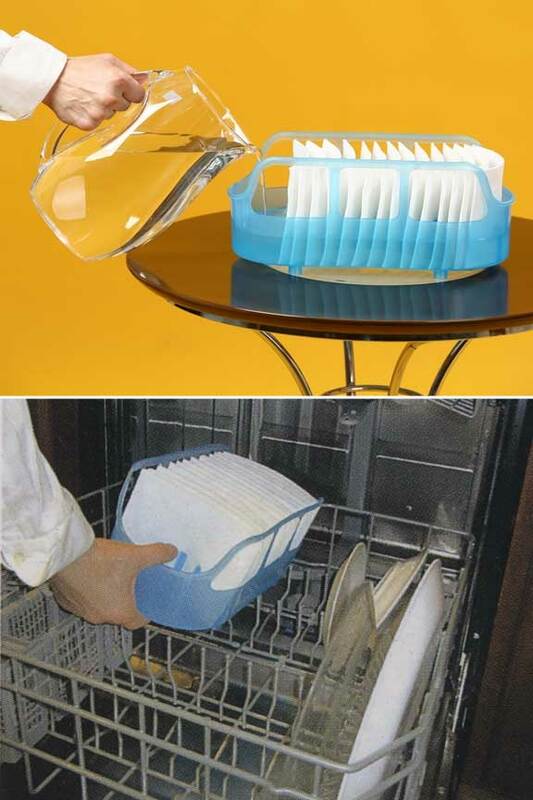 Washable Yes - Dishwasher Safe When Needed. Warnings Do not place on hot surfaces such as a radiator. This unit can melt, and water damage will result. Do not use with any fragrance or other chemicals such as germicide, bactericide, disinfectant, bleach, etc. G-Midifier (Green Humidifier) - A safer, cheaper and easier way to eliminate dry air in your home. 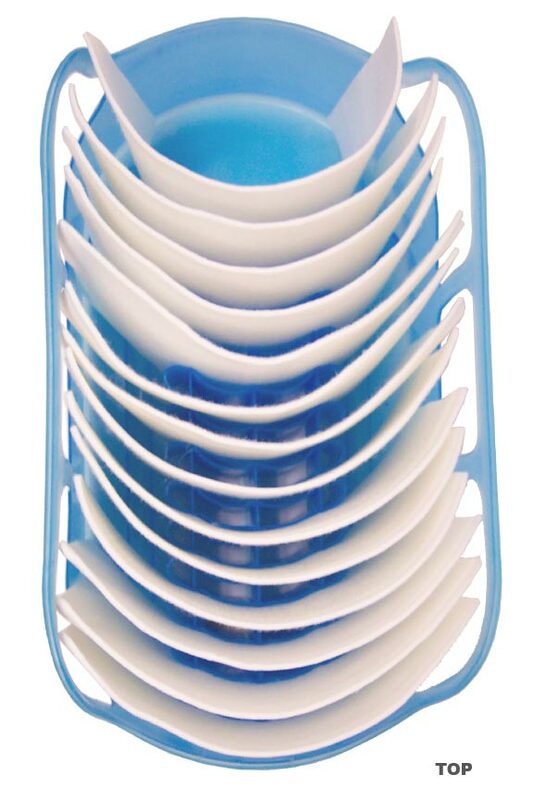 Simply fill with water and this clever device does the rest. No electricity necessary and very little maintenance ever! Order Yours Today! This is a great passive humidifier for homes with floor heat registers. They don't cause condensation on the windows and clean easily. I also use them inside the tracker pipe organ at church for a passive system to provide moisture when the heating system is on which causes the instrument to dryer and wooden parts to warp. Works great, as long as it's near a strong fan! I love this thing! I was skeptical when I bought it, because I figured that if it worked well, then why is there only one small company producing and marketing this type of humidifier? It comes across like an "As Seen on TV" type product. I needed a humidifier, but I didn't want to deal with the noise of another electronic device in my bedroom, since I already have an air purifier in there. I figured I'd buy this first, and if it didn't work, I'd return it and get a "real" humidifier. The first night, I filled it with water and placed it directly on the floor vent. In the morning, it looked like no water had evaporated at all. The next night, I placed it on top of my air purifier, which is fan-based and blows a much stronger air current than what comes out of the floor vent. That night, it evaporated about a half gallon of water. It's worked consistently since then, as long as I keep it in that one spot with the fan continuously blowing on it. I like to have as little plastic as possible in my bedroom because of offgassing, so I'm considering trying to make my own version of these out of a metal rack and squares of wool felt. In the meantime, I'll keep using this! These humidifiers do work well. I refill them every other day and the humidity in the room does increase. My only problem at the moment is that my kitty likes to drink the water so once that is solved everything will be great. Glad I ordered them. This is an EXCELLENT humidifier. It's compact, sturdy and very effective. A truly great buy! The water disappears pretty rapidly from the unit, so I guess it's humidifying the air. I don't really notice a difference. They are easy to fill and use about 1 quart each/day. The fabric fins get brown at the top edges. Can they be washed in a clothes washing machine? I am ignoring them for now. I cleaned one by hand, but the fins are a little difficult to replace in the box. On the whole I am pleased with this product. I love the G-Midifier.. since there is no electric it obviously is very quiet and the best part is IT WORKS! The only downside is I wish it held more water.. We are very dry here with the heat running all the time.. and I do have to fill it alot.. but it brings the humidity level up by around 5 or 6 points which is a noticeable difference.. I am thinking of getting a second one to put near another register! This item really works. I am currently using two of them and I can tell a difference in the reduction of static electricity in my home. I have noticed a difference in the moisture in the air where I work since I started using this. I'm not getting shocked anymore and my nose is not nearly as dry as it was before I started using. I've only had my humidifiers for a few days but so far I like them. I dislike this product because I have to refill it twice a day...my humidity level on my meter still reads only at 30% and it continues to be very dry in my home. I have two of them for both my bedrooms. Maybe this product should be made taller so more water can be added and you would not have to refill it for at least 1 1/2 days. I'm not very pleased with the product. No noise, no electricity, no more dry air. This G-Midifier is superb in its simple design and provides outstanding results. It adds moisture to the air. We have one in our bedroom on the floor next to the floor vent. In a 24 hour period it is almost empty, and where did it go? Into the air in our bedroom. My wife could immediately tell the difference in her skin. No more dry and itchy skin for her now. We have the second one in our living room on the floor next to another floor vent. They are simply fantastic during the winter months especially. I recommend the G-Midifier Humidifier to everyone. You will NOT be disappointed. SORRY FOR THE DELAY IN ANSWERING. WE DID RECEIVE OUR MIDIFIERS AND ARE VERY PLEASED. HAVE ONE IN OUR BEDROOM AND HAVE SEEN A DIFFERENCE IN THE AIR. WE WAKE UP WITH NO DRY MOUTH. WE HAVE ELECTRIC HEAT. I LIKE THE FACT THAT IT IS SO LIGHTWEIGHT YOU CAN PLACE IT ANYWHERE. GREAT FOR THE ELDERLY TO CARRY AND MAINTAIN. WE ARE BOTH IN OUR LATE 80'S. NO NOISE EITHER. I have been using this over a forced air heater and it makes a noticeable difference in my sleeping comfort. During the course of a typical night I don't ever feel dried out as opposed to when I wasn't using this device. Works a lot better than a bowl of water as well. Very happy I bought it. Rather than a humidity level between 10 and 10%, it's now 50% near my work desk. It's really helpful: my eyes aren't as dry and my plants are considerably perkier. We have hot water radiant heating in our home so do not have the option of adding a humidifier unit to our furnace. We had been using noisy humidifiers in the winter months for the bedrooms, but we were looking for a cheaper, quieter option. We found the G-midifier on the internet and it looked simple enough and the concept seemed sound. The question was if it would humidify enough for our dry winters. We've been using two of them in two of our rooms for a month now and they are working great. No more dry eyes or throat when we wake up in the morning. No electricity used and no noise! Perfect. This inexpensive product makes a big difference in the humidity level in my bedroom. I have to fill it often, but that's a good thing--the water evaporates into the air. I see that maintenance requires washing the unit in a dishwasher. How do you clean it if you don't have a dishwasher? A dishwasher is not required, but it does make it effortless. The base is made of plastic, and the pads are a thick fabric-like material. You can certainly hand wash in a sink, or wash outside as well. Does this device require distilled or RO water? My 32 grains hardness well water limes up our present humidifier in a few weeks. There is no specific water type requirement, but harder water will require more frequent cleaning of the pads to prevent build up. 7 of 9 Customer(s) found this Answer helpful. How often do the pads need to be replaced? They are totally washable and reusable, so most people use the same ones for years. I HAVE BASEBOARD HEATING, CAN I USE THIS? I LIVE IN A 3 ROOM APT. AND WOULD PROBABLY ORDER 2. HOW OFTEN WOULD I HAVE TO FILL WITH WATER? Yes. You can use it. Putting it over a vent can improve results, but it is not at all required. As far as how much water you will go through, that will vary depending upon several factors. It will be similar in frequency to other, more traditional, humidification products. 6 of 8 Customer(s) found this Answer helpful. What types of plastic are used in the unit? Is there any off-gassing? There will be no pungent odor or off-gassing when you receive this brand new. we have radiators where the heat comes out from the sides, but not the top. are we better off putting these on the radiators where the dry heat is coming from? or just putting it on a shelf closer to where we all sleep and wake up coughing with dry mouths?! thanks! Just place it on a shelf close to you. Only if you have forced air heating will it make a difference to have it close to the heat source. I don't have a dishwsher, can I just use some dish soap and warn water to clean the pads? Yes you can. That will work just fine. I had a humidifier and it turned my end table white and I noticed the bottom of the wall was starting to form mold so I got rid of it. I am 81 years old and can't carry a heavy humidifier. Will this do for dry eyes? Yes. This lightweight alternative will add enough moisture to the air to combat dry eyes, and it does not spray water everywhere so you won't have to worry about white residues or mold growth due to excess moisture. Mister & AC Adapter. A Humidifier, Air Purifier & Fragrance Diffuser.